Harrison Holt (1842-1870) was born in Saratoga Springs, NY to Andover native and butcher Stephen Holt and his wife Margaret (Fitzsimmons). The family moved to Grand Rapids, Michigan, where father Stephen worked as a ticket master but died in 1859. Harrison Holt likely travelled to Andover, bringing his father’s body to West Parish cemetery for burial, in company with his uncle Horace Holt. In the summer of 1860, they were both in Andover. Harrison enlisted as a private in the 30th Regiment of New York Volunteers in April 1861. He received several promotions but was badly wounded in the second battle of Bull Run and discharged from this regiment in March 1863. In June 1863 he joined the newly formed Massachusetts 55th Regiment of Colored Infantry. He served with this unit at Morris Island, South Carolina and was at the capture of Ft Warren, before being mustered out amidst a staff reorganization. In November 1863, he joined the First Massachusetts Cavalry and served as a 1st Lieutenant before receiving another wound on May 9, 1864 during a raid on Richmond under General Phillip Sheridan. He contracted an additional illness in the hospital and was discharged again in August 1864. 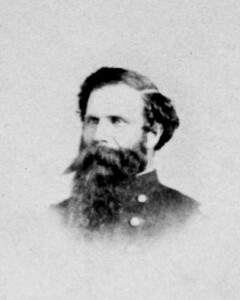 In 1867, Holt was appointed a 2nd Lt. in the 6th Regiment of Cavalry. He was married in Massachusetts before reporting for duty in Texas, where he contracted malaria in June 1869. He returned home on sick leave, but died of congestion of the brain resulting from the disease in February 1870.